The child, situated in a lower corner of the painting, opens —like the sides which define this angle— to the great spectacle of nature. In the same way, his backlit form, haloed by the splendour of the sun-drenched grass, is the very image of admiration, of the wonder which has transfixed this simple creature (the choice of a child here is no accident), spellbound before a mystery that surpasses and surrounds, and which the dull and ordinary in spirit do not perceive. 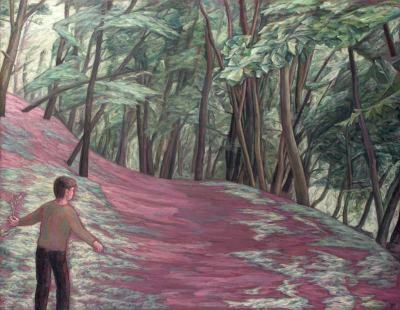 A spontaneous comment by one viewer: “It gives me such pleasure to see your series of paintings that celebrate creation: the boy spreading his arms before the trees, ready to embrace them, play with them; the young girls discovering the mystery of the sea and the dusk... what marvellous paintings they are! If I had seen only those two paintings of yours, it would be enough to convince me of your commitment, your dedication to quality, your non-conformism to so much modern confusion, your joyful purpose”.